In the previous article I loaded Magento 2 (M2) with 1M+ SKUs. 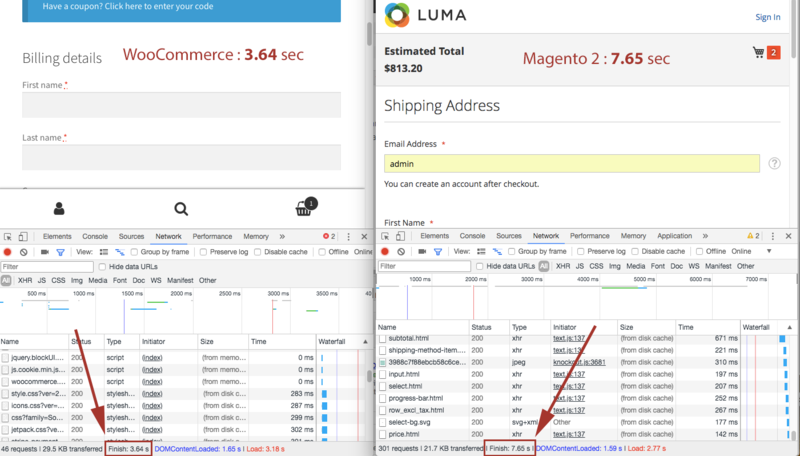 Today I will benchmark M2 against another open source eCommerce platform - WooCommerce (WM). We will compare how efficient these two frameworks handle more than 1 million unique products. Disclaimer: M2 and WM are two different platforms designed for different needs. It is not technically correct to compare them. Magento 2 is a lot more complex and feature-rich than WooCommerce. Still there are times when one needs to decide between M2 and WM and this article might help him/her make the right decision. 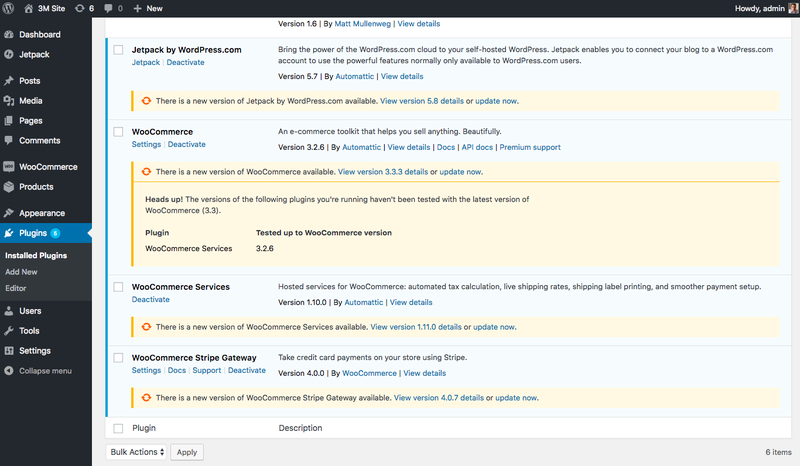 WooCommerce is a WordPress (WP) plugin. That said we need to install WP first. WP installation is all automatic (like Magento). You follow the instructions and a setup script does all the work for you. Once WP installed WM installation is just a matter of seconds. 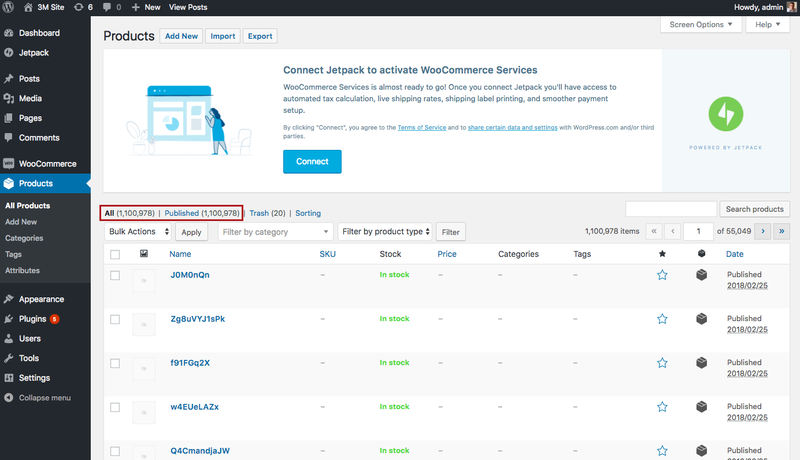 You download and copy WooCommerce module to plugins folder and activate it in WordPress backend dashboard. 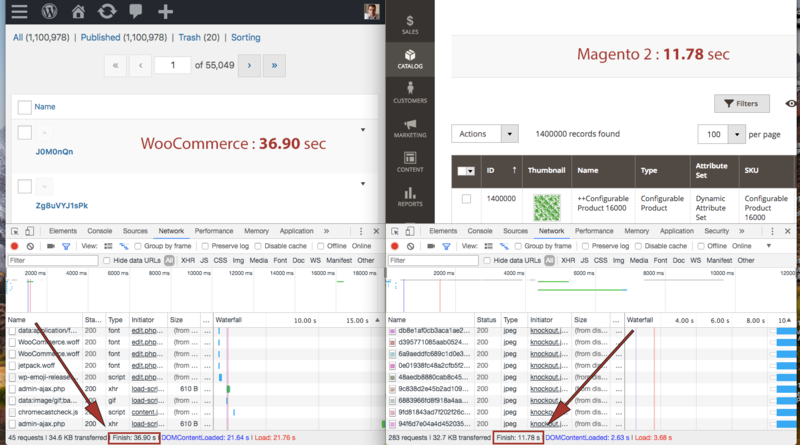 How to load Magento 2 with 1M products was shown in one of my previous blog posts. Now I show to repeat the procedure for WooCommerce. The program is pretty self-explanatory. The function generateRandomString is used to create unique SKUs. The rest is just how you initialize WordPress and insert a simple product. I found it somewhere on StackExchange Q&A site. Of course this script is not fast and on my 6 CPU core server it takes 3 sec to generate a new product or around 30k items per day. Not impressive when you have to have 1 million of them. I started the scripts simultaneously and they were creating 120k products per day. I tried to add more scripts but the generation speed dropped so I kept just four of them. It took around 10 days to finally have 1M+ simple products in the WooCommerce website. Then I could begin to benchmark Magento 2 against WM. 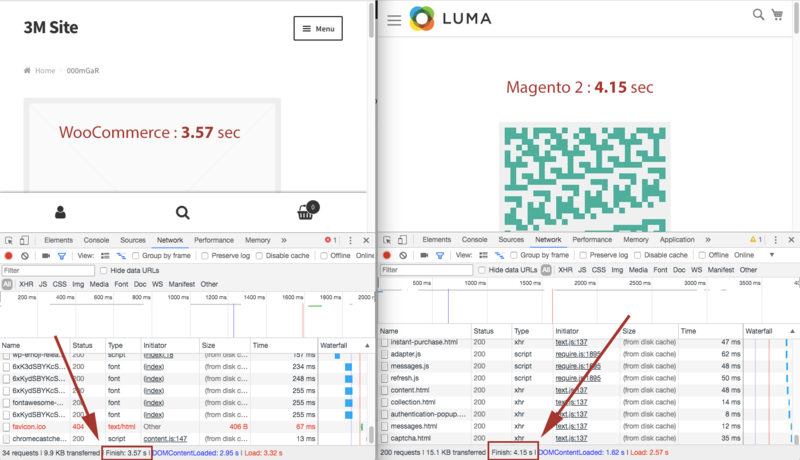 First I compared backend page speed. Since M2 loaded data with ajax calls I measured the full page load time of both platforms. I used Google Chrome Developer Tools to gather performance results. 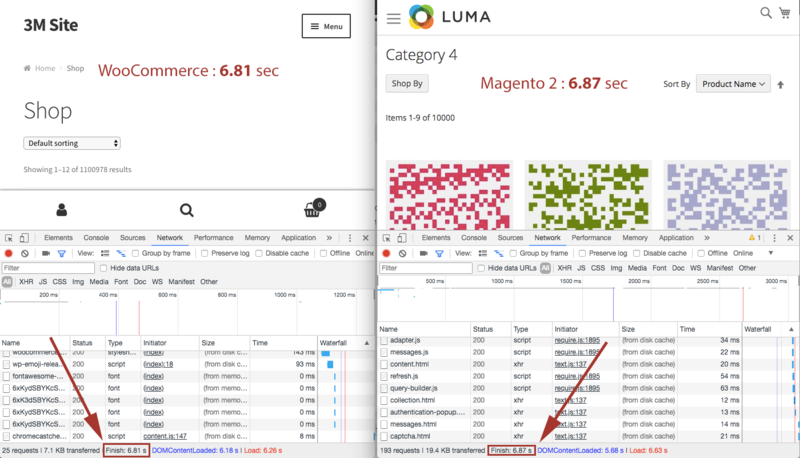 We can see M2 is almost 3 times faster than WooCommerce (we also see that M2 backend is not mobile friendly, unlike WM's one). And that was even true taking into account M2 had more products (1.4M) than WM (1.1M). What happens with individual simple product edit pages? Here WM is slightly faster. Let's move on to frontend benchmarks. M2 has full page cache (FPC) functionality for frontend pages. WooCommerce doesn't. I would have to turn M2 FPC of to make the frameworks even. We see a catalog page loads in approximately the same amount of seconds. WooCommerce serves simple products slightly faster. 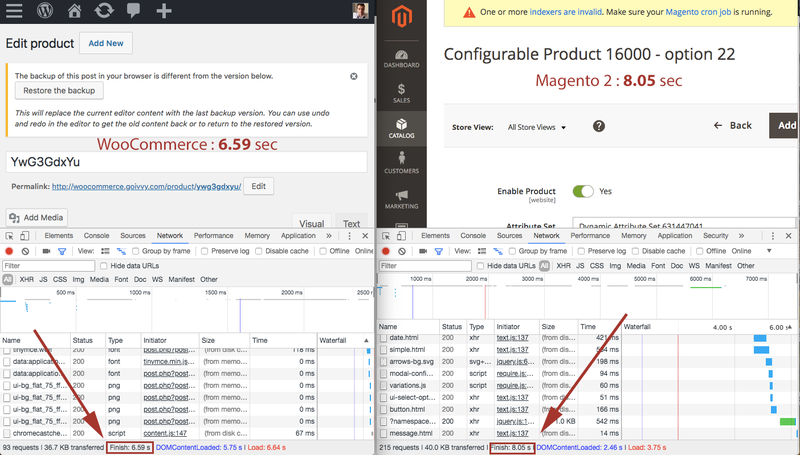 Magento 2 is a lot slower in that case. 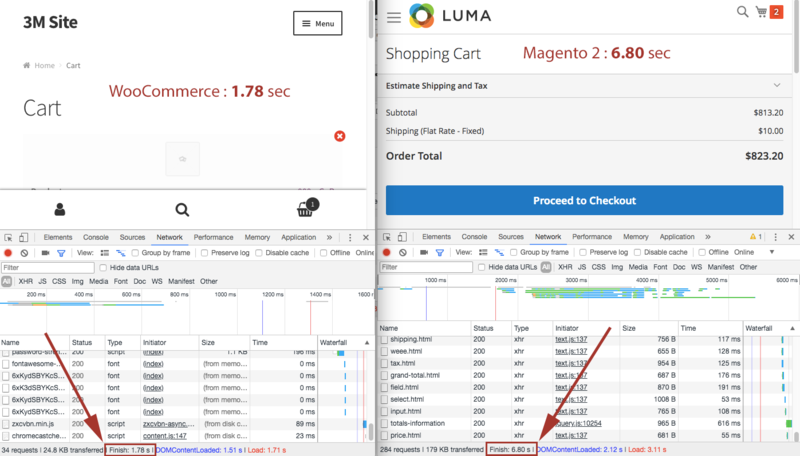 Indeed when you browse a WooCommerce site and add things to the cart it seems faster as compared to M2. Partly because WM cart area is simpler. As we can see WM's checkout is 2 times faster than M2's one. Overall WooCommerce feels faster on frontend but slower in admin panel. When you try to checkout Magento 2 with 1 million products is just too slow to be used for production. Of course I am talking about a stock installation - I am sure it can be tuned to be super fast. Both Magento 2 and WooCommerce can handle huge number of unique products. M2 manages 1 million product faster in backend whereas WM is faster on frontend. Still I can't say which one of the two frameworks is better for 1M SKUs. The choice depends purely on one's requirements. Magento 2 seems more flexible but WooCommerce is simpler and that always leads to a better performance. If you find this post interesting do not hesitate to sign up for our newsletter and join the 889 people who receive Magento news, tips and tricks regularly. @Amine, I can't really say, I haven't tested. Is that possible for woocommerce? They think they are using Java.